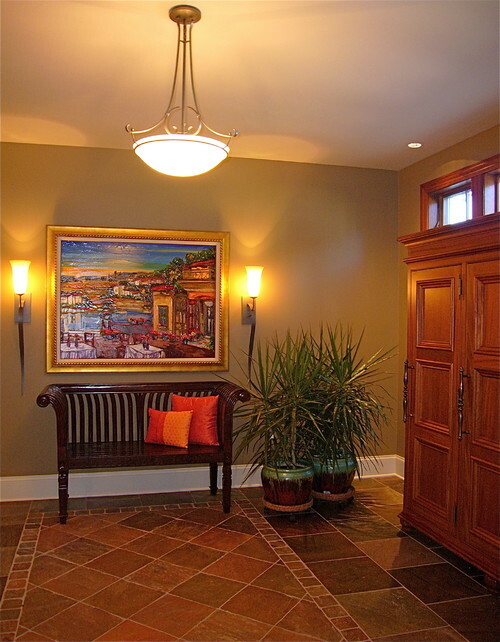 Slate tile flooring is always a rock solid addition to any home. This year’s slate tile flooring trends are truly remarkable and we would recommend taking a peek at them before you decide on new tile for your home. Slate’s moving from the floor to the wall. Many homeowners are opting to line their halls, bathrooms, and kitchens with this marvelous material. Not only is it strong and durable, but the patterns and colors are truly unique and give every room a genuinely classy appearance. Coupled with their natural waterproofing and fireproofing properties, slate’s grey, brown, and black surfaces are popping up everywhere from 5th Avenue to Rodeo Drive. Homeowners are also installing slate on the patio. Its natural appearance is a welcome addition that creates the perfect segue between indoors and outdoors. And while irregular sizes are still popular, more and more manufacturers are producing it in standard sheets that are 12’x24,” which makes installation of slate tile an easy task. Our team would love to discuss the latest slate tile flooring trends with you. We invite you to contact Conestoga Tile with your questions regarding the tile flooring options we have available for you.